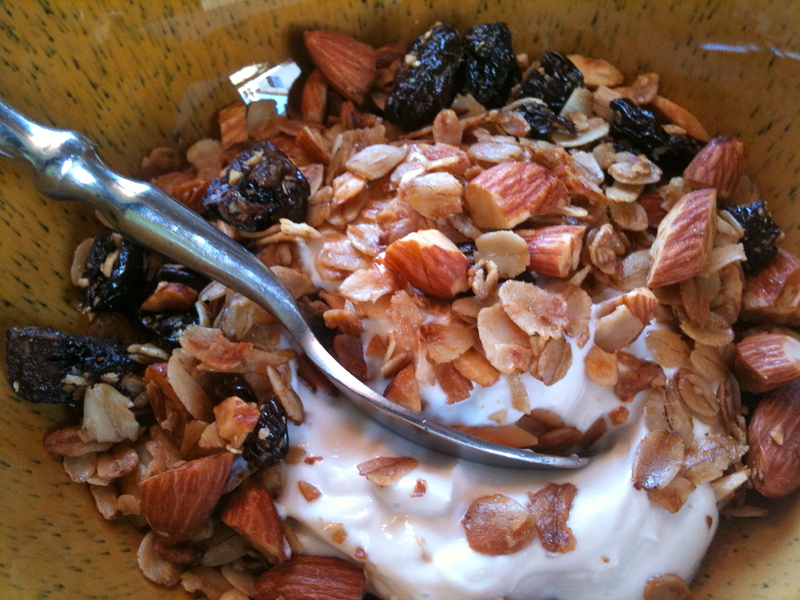 While I was in Texas with the Gilded Girls – Debbie made Granola. You know when you watch someone cooking and they do it all from memory? It’s effortless, easy to watch and the result is always tasty and filled with love. While she was hosting this huge event with a million things still to be done – she whipped up the best granola I’ve ever had. I watched and took mental notes. Once I was home I set to work on replicating what she had done so easily. After testing a few different options and texting her for the recipe in her head I came up with this. It’s really about the ratios of your wet to dry and the flavors you add, like a blank canvas you make it all your own. Homemade is ALWAYS better, you know exactly whats in it and its way more cost effective. 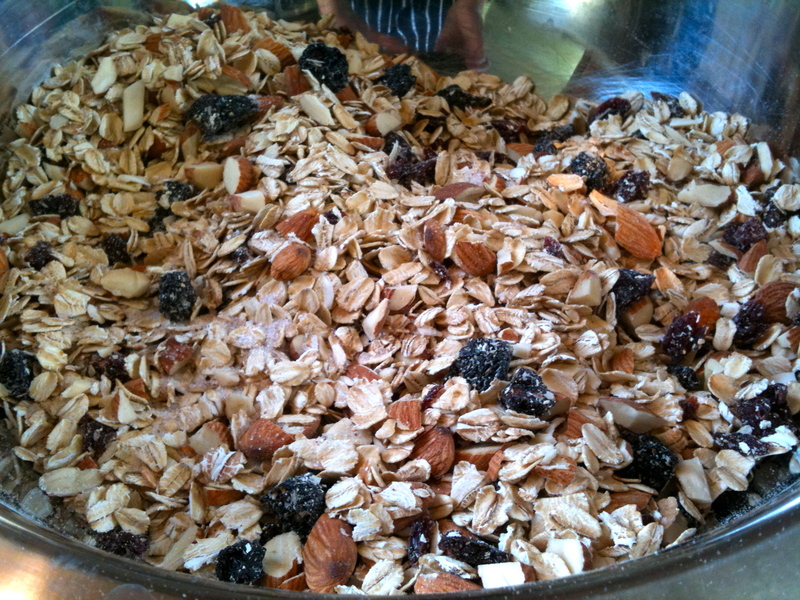 5 cups whole oats– not the quick cooking kind, buy them bulk from a health food store way cheaper. 2 cups chopped nuts– I used whole roasted almonds not salted, you can control the salt levels this way if that is a concern for you, if not rock the salted nuts. You can use any nut you like, chop them or not but keep them bite size friendly. 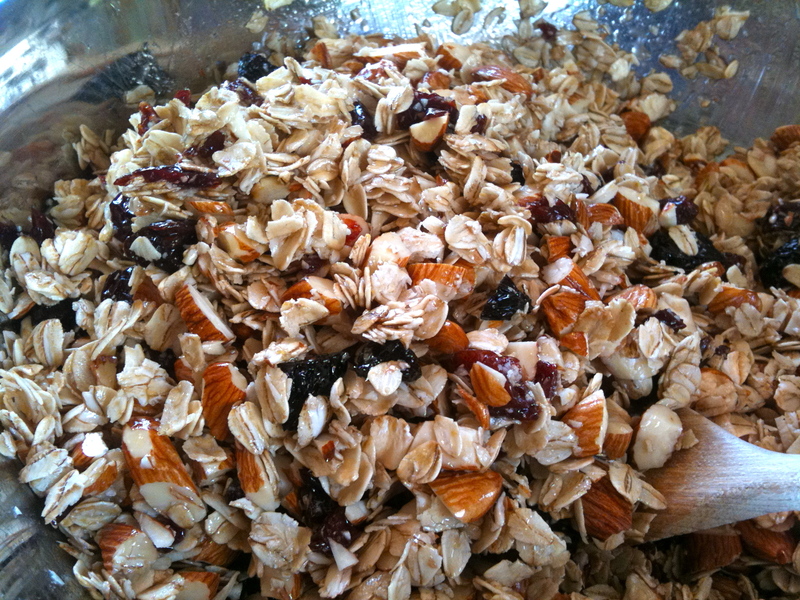 3/4 cup dried fruit– I used dried cherries, a mix of 2 different kinds, chopped. Cranberries are really good and if you must, use raisins, but that would just ruin it! for me anyway, I’m a freak! I can’t stand raisins- it’s a childhood trauma- long story. 2 cups shredded coconut– sweetened or not – your choice – omit altogether if you don’t do coconut, Debbie used it and it was delish! 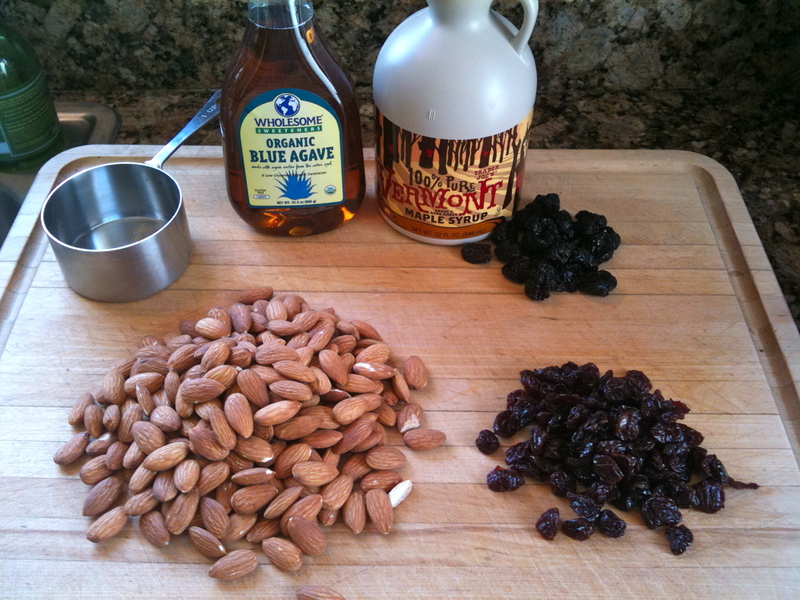 1/3 cup honey– agave syrup or maple syrup work really nicely as well or a mix of all 3. 1/4 brown sugar– regular brown sugar, dark brown sugar, or white death aka white sugar. 3/4 teaspoon salt– if you’re using salted nuts take the salt down to 1/4 teaspoon, you can also add 1 teaspoon of cinnamon or pumpkin pie spice would ROCK! Preheat oven to 375. In a small saucepan on the stove combine the oil, sugar and the honey until melty warm. In a large mixing bowl combine all the dry ingredients. Pour the liquids over the dry and mix really well, do it with your hands so you can feel that every item is coated. Line a baking sheet with parchment paper or a silpat and spread the mixture flat on the sheet. Bake for 30-40 minutes, mix/toss half way through the cooking time. 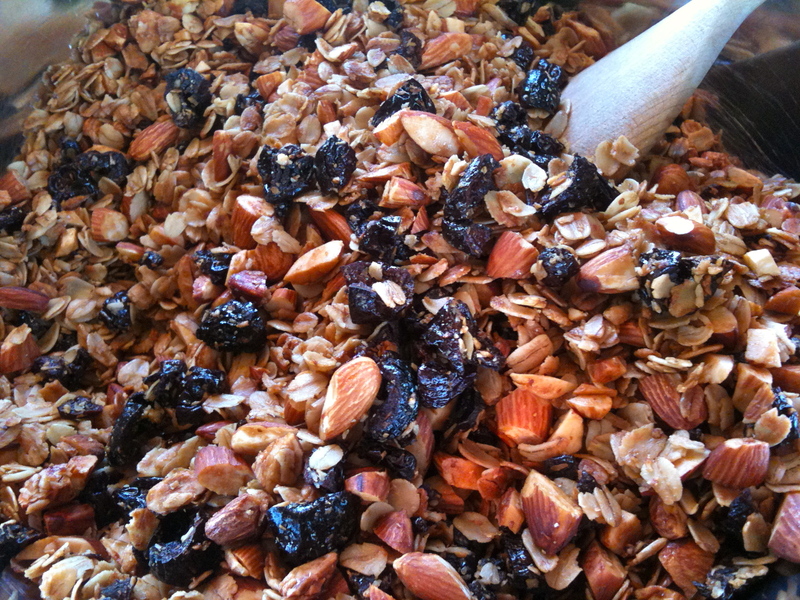 You want it to get browned up, you will smell the nuts getting all toasty too….. smells so good. Watch it towards the end- you don’t want burned Granola. The mixture will seem soft still, but it will crisp up as it cools. 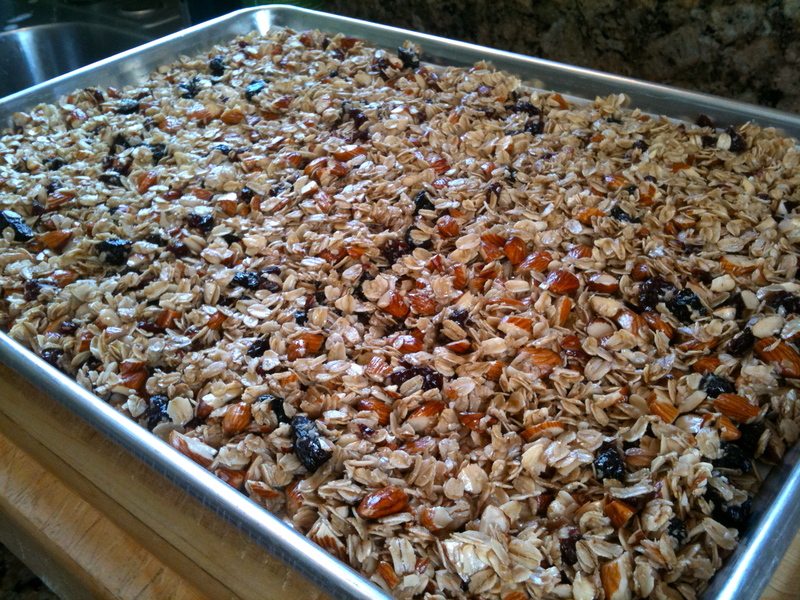 Keep the granola in an airtight container or ziplock baggie for up to a week – 10 days. Sprinkle over yogurt, ice cream, pancakes or eat like popcorn while watching a movie. Thanks Debbie for showing and sharing this with me, it’s so easy. I’m thrilled y’all are moving back to California. Maybe I can get her to guest blog her Red Velvet cupcakes sometime soon!! They are to die for! Oh I love Debbie’s granola! I love that you’re sharing the recipe, AND that we can make it to suit our families taste buds! i made it yesterday at my mom’s. she had cherries. no butter for us – used the agave nectar and came out oh so good!! making the baked eggs for Ben for fathers day… i love that you’re doing this, you inspire me to get back in the kitchen! Yea Kim!! Miss you girl, we should get together and hang soon.